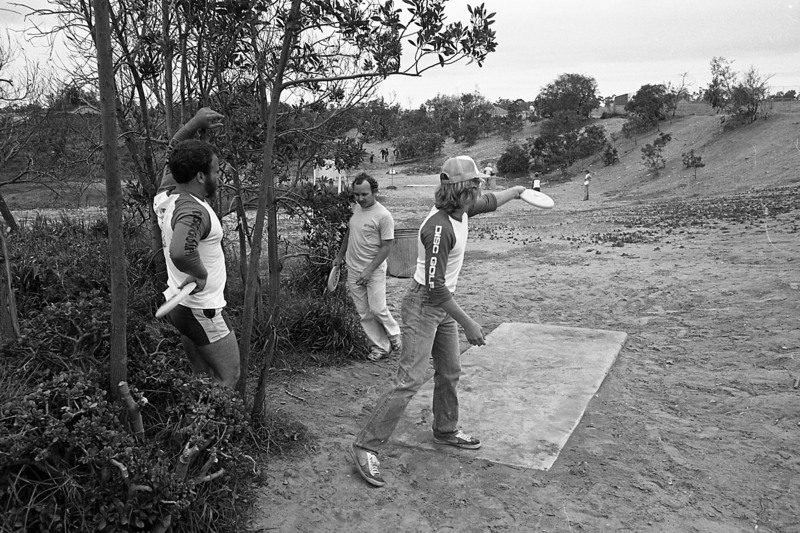 Morley Field Disc Golf Course was the brainchild of Snapper Pierson, an avid disc golfer who in 1978 worked to convince Balboa Park management to let him build a disc golf course in a little-used portion of Morley Field just east of the archery range. He installed concrete tee pads, erected signs and baskets, watered and groomed the landscape, and more. Soon he was able to convert storage space in a brick building that housed the public restrooms to open a small pro shop from which to operate. He began to sell discs and refreshments and organized competitive tournaments. At first use of the course was free of charge but eventually a fee was needed to help pay for the expense of maintaining the course. 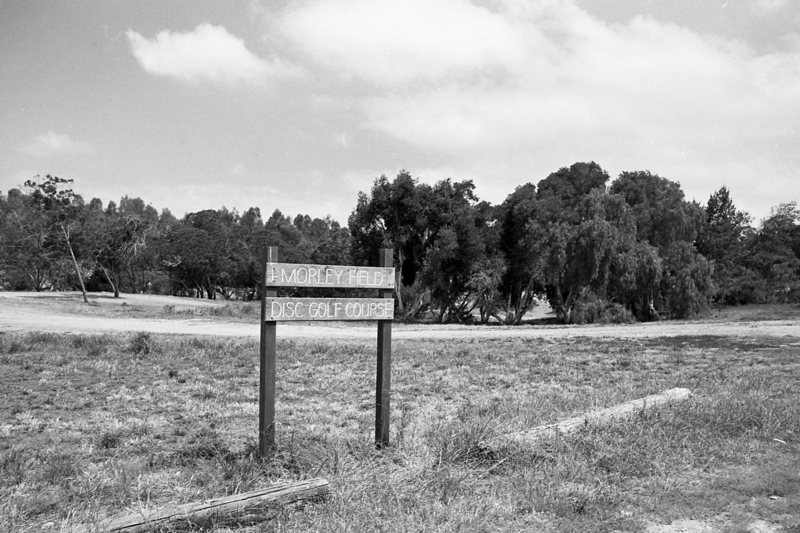 The course continues to grow in popularity (click here for more Morley Field history). 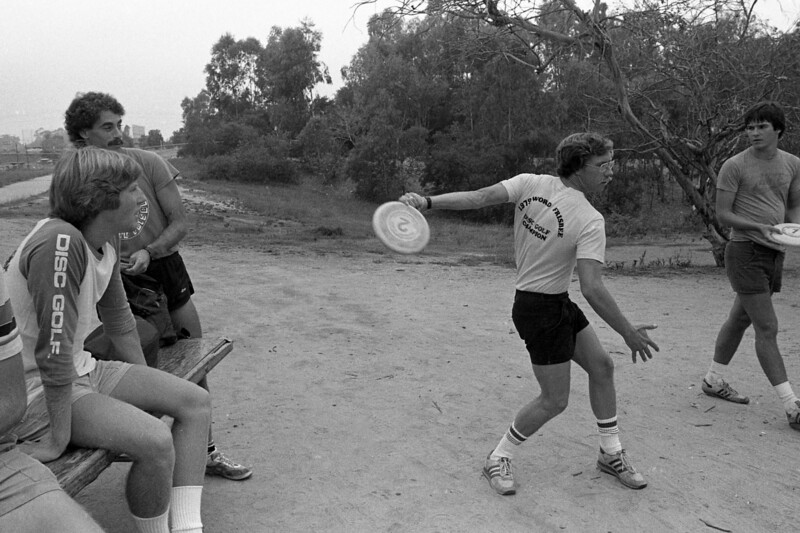 My neighbor Bruce Woodruff told me about the course in 1979 when I was living in Hillcrest. Soon I was hooked and we would head over to the course almost every day after work to shoot an evening round with friends and acquaintances. 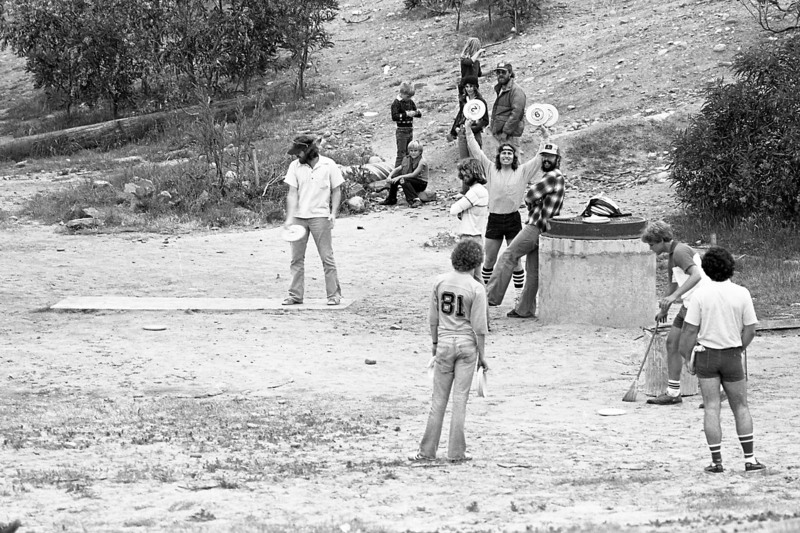 In those days I was teaching myself photography and practiced by taking pictures of disc golfing at Morley Field. I shot exclusively in black & white because I developed and printed my pictures in a homemade darkroom in my apartment bathroom and it was less expensive and complicated than processing in color. Since then most of my negatives have been filed away in binders. I recently bought a film scanner in order to convert the negatives to digital format, both for preservation purposes and to able to share some photos online. Who knows, some people might come across these pictures and see themselves. I’ll be posting a selection of photos in a short series of posts in the coming weeks. This is the first installment. 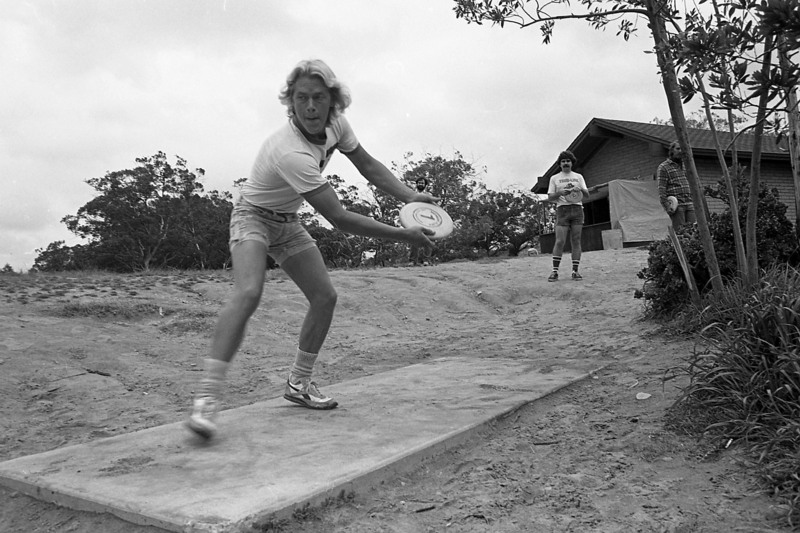 Snapper Pierson demonstrates a catch called “scarecrow.” His shirt: 1979 World Frisbee Disc Golf Champion. 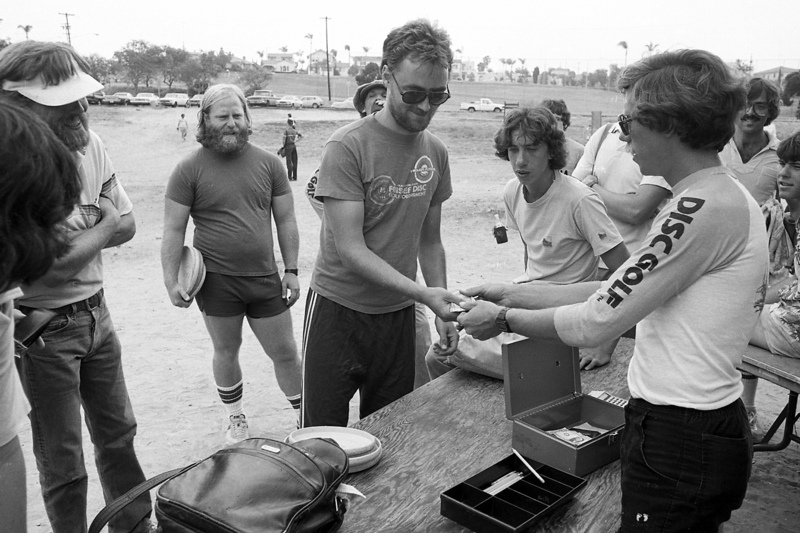 After one of the earliest local tournaments, Snapper gives cash payout to Bruce Woodruff. Shooting on hole 10 just outside the pro shop. Another view of the tee pad for hole 10. A long putt for hole 1. This entry was posted on January 8, 2018 at 10:24 am	and is filed under Sports. 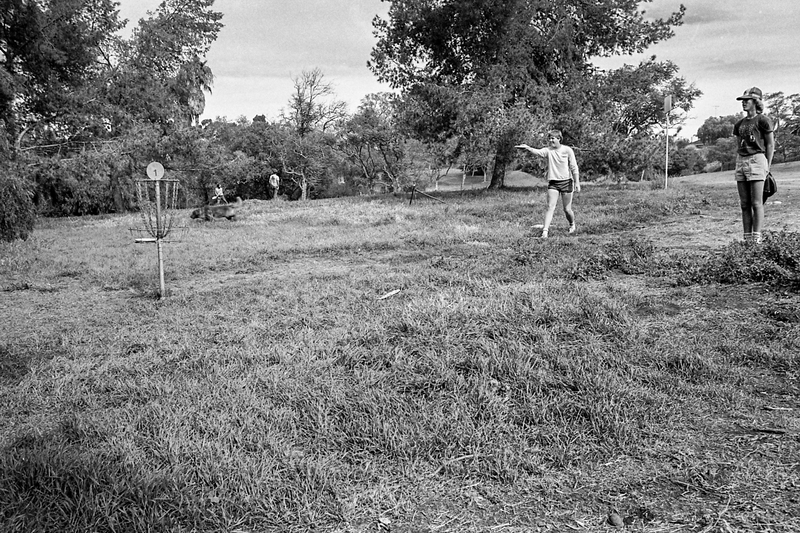 Tagged: Disc golfing, Frisbee golf, Morley Field Disc Golf Course. You can follow any responses to this entry through the RSS 2.0 feed. You can leave a response, or trackback from your own site.